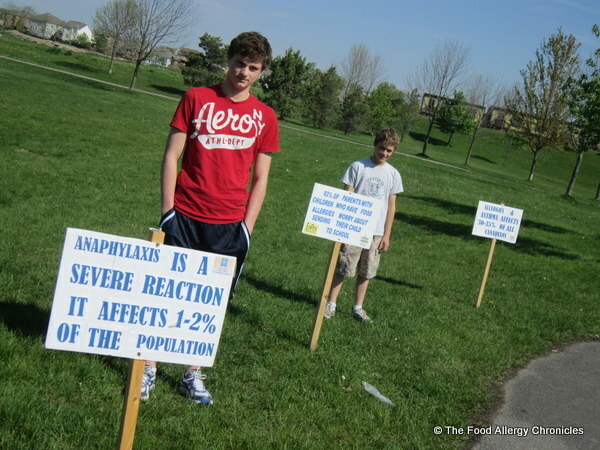 Posted on May 14, 2012 by Susan H.
May is Food Allergy Awareness Month. 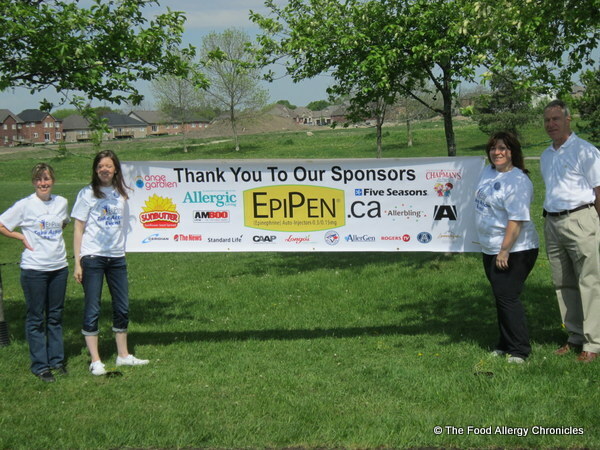 During the month of May, the Allergy, Asthma and Information Association’s (AAIA) Epi Pen Take Action Event is encouraging allergy communities across Canada to join together to help raise awareness and funds for anaphylaxis research and education. Funds raised by the Epi Pen Take Action Event are donated to the Canadian Allergy, Asthma and Immunology Foundation (CAAIF). Over the past 6 years, the AAIA has donated over $320, 000 to fund research and patient education. That is awesome! In 2010, I ran my very first 10 km race at the Epi Pen Take Action Event. I enjoyed it so much, I signed up for it again in 2011. 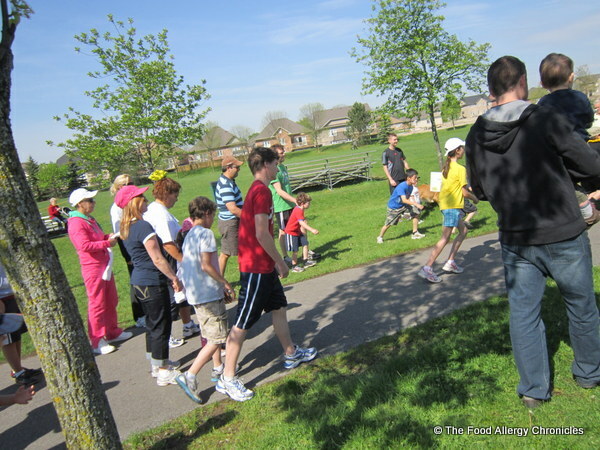 This year, May 12, 2012, our Epi Pen Take Action Event was in Brooklin and hosted a 2 km family walk/run. 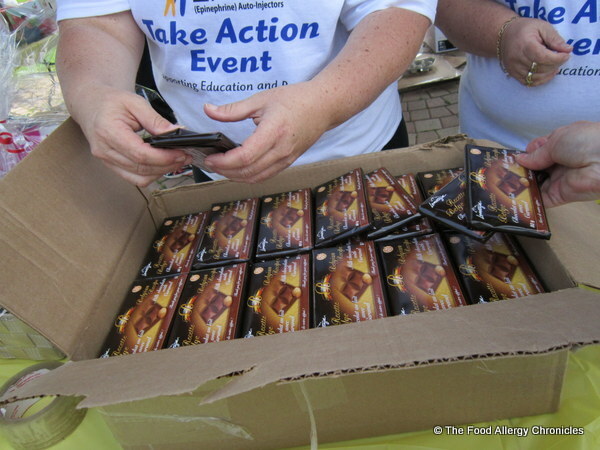 Epi Pen’s Take Action Event has always been a fun family event! Depending on your location, there are activities, special guests and musical performances. Our Brooklin location had a bouncy castle, face painting and Beebo Smile was there singing and entertaining us all! 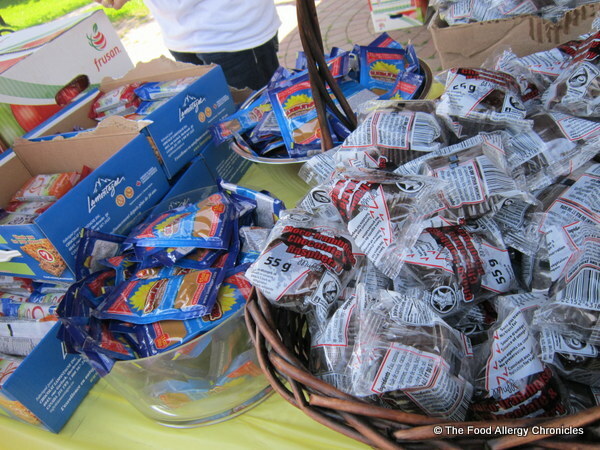 Samples of some allergy friendly products were available: Guardian Angel Foods Chocolate & Raspberry Muffins, Sunbutter Natural Sunflower Seed Spread, Lamontagne Peanut/ Nut Free Cereal Bars, fresh Royal Gala apples, and bottled water. Lamontagne Belgian Recipe Milk Chocolate with Caramel were handed out at the end of the event…Matthew was especially happy! “Mom! These are the fancy packaged chocolate! These are really special!” he announced excitedly with a big smile across his face. All three of us put our names in for the door prizes…Michael’s name was called. He chose this package which he presented to me on Mother’s Day. It was filled with hair products and a funky hot pink hair dye…I just might be a ‘tad old’ for pink streaks in my hair! 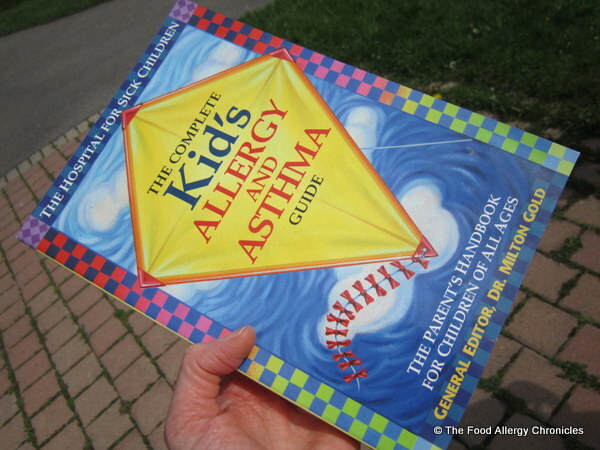 My name was also called…I chose a book…’The Complete Kid’s Allergy And Asthma Guide’ by General Editor, Dr. Milton Gold. I know just who to give this to…my friend whose 2 year-old son has eczema, food sensitivities/allergies. She was unable to attend this event…such a shame as this event was such a family affair…her son would have loved it! I enjoyed meeting some of the great volunteers at this years Epi Pen Take Action Event. From left to right are: Jodi (volunteer), Stephanie (volunteer and follower of The Food Allergy Chronicles), Clare (Lead Volunteer) and Dr. Leith (President/Chair of the Canadian Allergy Asthma Immunology Foundation/CAAIF). ‘Missing in action’ from the photo is…Monika, Regional Coordinator from The Allergy Asthma Information Association. 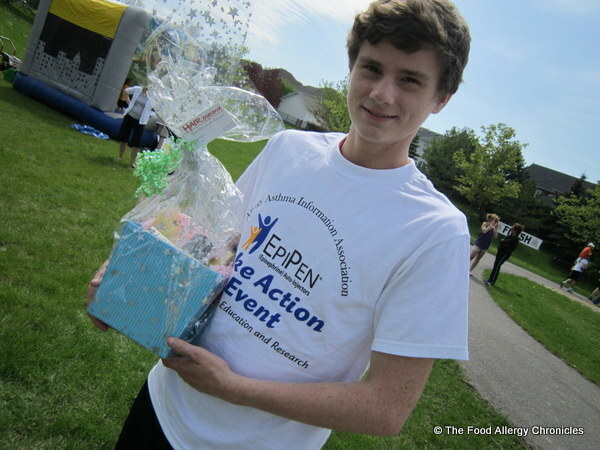 The Epi Pen Take Action Event is a great way to meet other families living with food allergies/asthma on a daily basis. It is an event where children with food allergies are the ‘norm’. It brought tears to my eyes as the children were gathered around to receive their allergy awareness T-shirts…someone announced, “Look around you. The boys and girls here all have food allergies just like you!” Empowering words! For me personally, attending The Epi Pen Take Action Event was energizing…being surrounded by families ‘just like mine’…like-minded families who ‘get it’ …revitalizes my spirit. Knowing our family is not alone in our food allergy/asthma journey…priceless! Taking an active role in raising awareness and funds to support allergy research and education keeps the ‘hope alive’ that one day there will be answers to all of our questions…and a cure! The allergy/asthma community is one very supportive community. If you are feeling lost, confused, overwhelmed, alone…know that there are families in your community living with food allergies/asthma. An event like the Epi Pen Take Action Event brings us all together! I am so appreciative! What are you waiting for? Find the nearest Epi Pen Take Action Event near you, grab your running shoes and join the many families with food allergies/asthma ‘just like you’ trying to make a difference in the world of allergy research and education. Together, we can support each other and take part in finding a cure! Question: Have you or will you be attending your local Epi Pen Take Action Event? Have you ever participated in one before? What was your experience? This entry was posted in allergies, charity events, EpiPen Take Action Event, multiple food allergies and tagged Allergy Asthma Information Association, Canadian Allergy Asthma Immunology Foundation, Epi Pen Take Action Event, may is food allergy awareness month, raising awareness of food allergies by Susan H.. Bookmark the permalink. You are not too old for pink hair dye! A ringlet or two in bright pink would be fun – maybe for the marathon in a couple of weeks??? Thank you for sharing this event. I hope we will be able to attend one someday.